When weight and space are concerns Dead Down Wind comes through with the Evolve 3D ESP Pac-It refills, that pack easily and refill your field spray bottle when mixed with water from any source. Evolve field spray, Dead Down Wind's newest enzyme technology that prevents and terminates a broader spectrum of odor molecules including human, smoke, gas, and other synthetic contaminant odors. 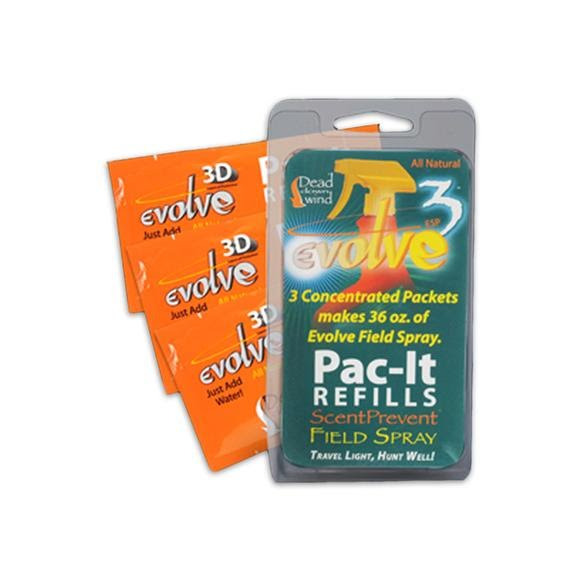 When weight and space are concerns Dead Down Wind comes through with the Evolve 3D ESP Pac-It refills, that pack easily and refill your field spray bottle when mixed with water from any source. Evolve field spray, Dead Down Wind&apos;s newest enzyme technology that prevents and terminates a broader spectrum of odor molecules including human, smoke, gas, and other synthetic contaminant odors. It is the last line of defense against any alarming contaminant scent a hunter may acquire before and during the hunt. The sprayer is an inverted technology that will allow you to hold the bottle upside down and spray out the product until the bottle is empty. For best results, use the full ScentPrevent system of laundry, body and field products. Shake well before using. Compact at 4.5” x 2.5”. Mixes with water to refill DDW sprayers in the field.